Marek Budzyński is an architect and urban planner. He designed Warsaw’s North Ursynów estate using his ideas of ‘linear concentration’, which developed an approach to spatial planning that took into account relations among people as well as between man and nature. The architect’s key field of activity is public buildings. Budzyński has developed a distinctive style, combining monumental, pompous classicism with organic motifs and symbolism. Budzyński graduated from the Faculty of Architecture of the University of Technology in Warsaw in 1963. In 1985, he received his PhD from his alma mater. From 1992, he has been an associate professor and director of the Faculty of Urban Design. He also taught at the University of Technology in Łódź (1983-1985) and at the Copenhagen Academy of Fine Arts’ branch in Aarhus. Since 1992 he has run the Badowski, Budzyński, Kowalewski architectural studio in Warsaw. Budzyński’s most significant urban realization is the North Ursynów estate in Warsaw, designed in collaboration with Jerzy Szczepanik-Dzikowski (and his team) and Andrzej Szkop. Construction began in 1975, and the first residents moved in in 1977. The Ursynów estate incorporated Budzyński’s idea of ‘linear concentration’, which developed an approach to spatial planning that took into account relations among people as well as between man and nature. It was not meant to be a typical housing estate of blocks of flats, but a standalone piece of the city built on a human scale. The layout included not only residential buildings grouped in small colonies, but also schools, service centres and venues facilitating the integration of residents: cafes, clubs and self-service laundries. The network of streets and squares was delineated to impart a sense of intimacy to the estate. However, not all of the plans were realized due to opposition from sections of the authorities of the time. Moreover, some of the realized concepts, such as the idea of separating pedestrian and vehicular traffic, popular in the 70s, also proved not to work as planned. The Ursynowski Passage and the Church of the Ascension in Ursynów, 1982, project: Marek Budzyński, Zbigniew Badowski, photo: Marek Budzyński Architekt Sp. z o.o. Together with Zbigniew Badowski, the creator of Ursynów estate also designed the Church of the Ascension (1980-1985). The church's squat, spread out structure clearly refers to the historical forms of Polish architecture. Both sides of the façade bring to mind provincial Baroque forms, and the buttresses of the side elevations refer to the Gothic. All these references to the Polish architectural tradition are brought to the fore by the materials used – unplastered brick, with stone at its base. The dominant decorative element is a monumental Latin cross in the centre of the façade. Its lower part was designed as an entrance and its upper part is a skylight. In the Ursynów district, Budzyński also designed a block estate on Herbst Street and the Pod Brzozami estate, which is still under construction. While creating the project, we aimed at referring to the mood of this special site of the two former cemeteries, and to the hill, which in the past has played a significant role in the lives of the inhabitants of Białystok. We have attempted to maintain a dialogue between the hill and the church of St. Roch. We wanted to create a certain atmosphere of coexistence between cultures that have been partially destroyed or neglected. Our intention was to combine nature with culture. The Supreme Court in Warsaw, 1996-2000, project: Marek Budzyński, Zbigniew Badowski, photo: Marek Budzyński Architekt Sp. z o.o. The rhythm of law regulates and directs the rhythms of human life in the community. The rhythm of the Columns of the Law regulates and arranges the square. It structures the shape of the architecture and brings into a coherent whole the past, the future, and forms that are perfect or incidental, incompetent or indifferent. Rational objectivity, clarity of expression, transparency and readability of the decision as well as determination stemming from humanistic bureaucracy are the key features of the procedures characteristic of the Administration of Justice. The Campus of the University of Białystok, project: Marek Budzyński, photo: Marek Budzyński Architekt Sp. z o.o. Budzyński is also the designer of the campus of the University of Białystok. This is the largest investment in the history of the University (2011 - 2013; under construction). Among the edifices to be constructed on Ciołkowskiego Street are the buildings of the Faculty of Physics, the Chemistry Institute connected with the University Cultural Centre, the Institute of Biology and the Faculty of Mathematics and Computer Science. The philosophical concept of the project involves combining different scientific disciplines in an effort to discover one common truth. 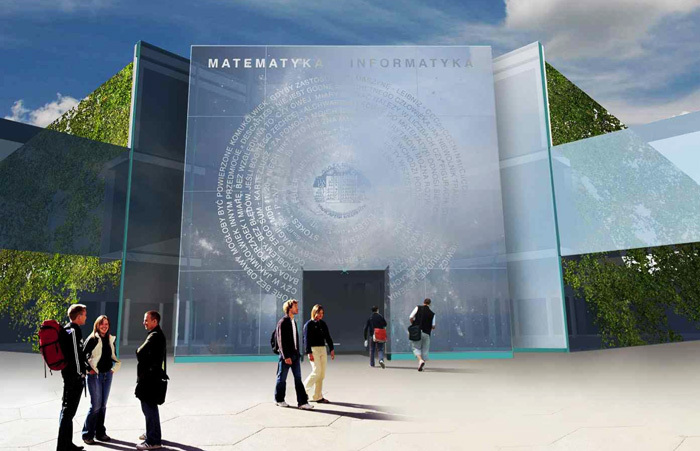 The buildings of three faculties of science are to be located at the Synthesis of Science Square including the building of the Computation Center, the Astronomical Observatory tower and the Andrzej Myrcha University Centre for Natural Sciences. The campus covers an area of 30 hectares, half of which are to be green areas. The view from the classrooms’ windows will extend to the tree-lined Sunny Square, from where alleys that lead throughout the campus radially spread. Marek Budzyński, project of the Temple of Divine Providence, 2000, photo: Marek Budzyński Architekt Sp. z o.o. The most significant of the architect’s unrealized projects includes the building of the Polish Embassy in Berlin (1997, designed with Adam Kowalewski) and the Temple of Divine Providence. The last project is the result of a competition announced in 2000, in which three entries equally received the first prize but only Budzyński’s design was selected to be built. The decision to build the temple, however, was cancelled due to its high cost. In 2001, in the course of a subsequent competition, the jury selected another project. Budzynski’s design included a heaped mound topped with a crystal skylight, with the temple hidden underground.